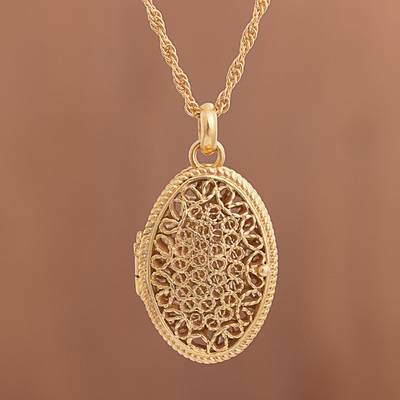 21k Gold Plated Silver Filigree Locket Necklace from Peru, "Shining Fantasy"
Intricate filigree work displays the expert craftsmanship of artisan Giuliana Valz-Gen of Peru. The artisan designs this sophisticated necklace using sterling silver plated with 21 karat gold for a shining, luxurious finish. The locket pendant opens to store photos or mementos.